Meet Krissy Heflin — an Awesome Special Olympian! My name is Krissy Heflin! I’m 33 years old and live in San Luis Obispo, California. I was born with a rare syndrome called Moebius Syndrome and I’m also legally blind. I started participating in Special Olympics when I was a young child. 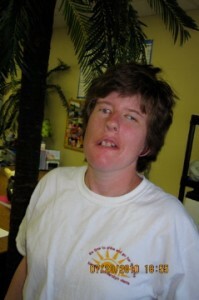 I got involved in Special Olympics when I went to Chris Jespersen School in San Luis Obispo. Chris Jespersen School was a school for children who have different types of disabilities. I missed 6 years of participating in Special Olympics after I graduated from Chris Jespersen School because I went to Oceano Elementary School in Oceano, California after graduating from Chris Jespersen School and didn’t know that I could still participate in Special Olympics. I started participating in Special Olympics again when I was in the eighth grade. I was seeing an Occupational Therapist who helped me get involved with Special Olympics again and I have been an athlete and participant ever since. When I first started particpating in Special Olympics I just particpated in our local area meets. I did track and field events. I have done the 50/100/200-meter dash and the standing long jump. I have also gone to the summer games in, Los Angeles/Long Beach, California too. I now play bocce ball and have participated in bocce ball tournaments and have played bocce ball at our local area meet and summer games. I’m also a Global Messenger and on the Athlete Input Council. The Global Messengers get to go out and give speeches about Special Olympics at clubs/organizations/schools. The Athlete Input Council is a council of athletes that meet once a month to discuss what’s going on in Special Olympics, try to make Special Olympics a better program, and we also come up with fundraiser ideas and talk about fundraisers. In December 2011 the San Luis Obispo County Special Olympics had our 2nd anual Dance-A-Thon which was put on by the Athlete Input Council and it was a success. When I’m not participating at a Special Olympics event/function I work 3 days a week at Trader Joe’s in San Luis Obispo. I do facing, a little bit of stocking, and bagging at Trader Joes. I also attend a few blind camps too.